The Economic Reality Of Tough Immigration Laws Immigration is often debated in terms of justice, rights and protection of our borders. But there's a business story as well. 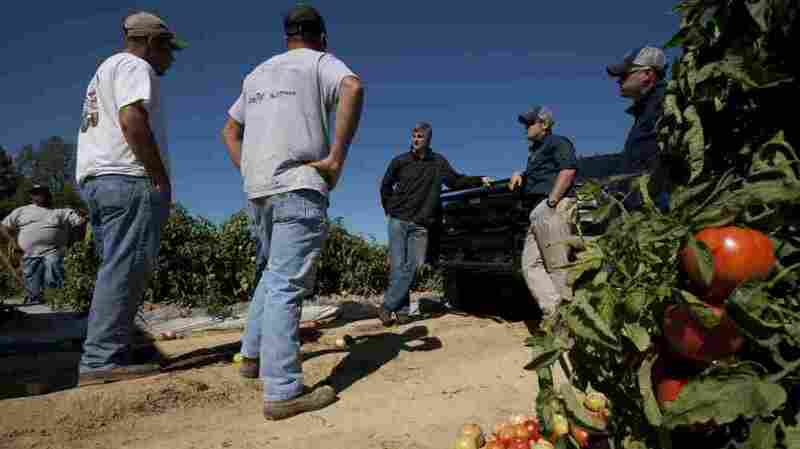 Can the U.S. economy really function without undocumented workers? State Sen. Scott Beason, R-Gardendale (center) talks with tomato farmers about the new Alabama immigration law on Chandler Mountain in Steele, Ala. Beason, who helped draft the measure, said he was sticking by the law although he would try to find relief for farmers who rely on migrant workers to harvest their crops. Whatever you think about the immigration policy in the United States, there is clearly the law and then there is reality. Gordon Hanson, an economist specializing in the impacts of immigration, studies the reality side of things at University of California-San Diego. He says that for decades there has been an unwritten social contract that says the U.S. isn't going to make it easy for immigrants to get in; there will be physical barriers and it will cost time, money and personal risk. "What that did in effect was to select out people who weren't serious, to select out people for whom the opportunity of being in the United States didn't matter that much," Hanson tells weekends on All Things Considered guest host Robert Smith. This policy was good for businesses and the workers who made it across the border. It created an ideal workforce of individuals focused on working, as long they were able to produce identification, valid or not, Hanson says. Jeremy Gonzalez picks tomatoes on a farm in Steele, Ala. Much of the crop is rotting as many of the migrant workers who normally work these fields have moved to other states to find work. There were flaws, but from a business point of view, this system was stable and predictable, Hanson says. Businesses could plan based on the reality of immigration enforcement. But tougher new laws in Alabama and Arizona changed all of that, amounting to what Hanson says is chaos. That's what's happening on Jamie Boatwright's farm on Chandler Mountain in Alabama. His large variety of tomatoes are ripe and ready to pick, but there's a problem — no pickers. Most of Boatwright's usual workers left Alabama after the new immigration law went into effect in the state. The law allows police to detain anyone they suspect of being an undocumented immigrant. Kids can't go to school without proving they are U.S. citizens. Many of the field workers in Alabama have fled to Florida, where there are fields with better work and no hassles. Boatwright says he never knows how many pickers will show up. "It varies from day to day. Sometimes we have six, sometimes we have seven, sometimes eight," he says. "It just depends [on] their level of anxiety toward being able to come to work that day." Republicans say the government should stop interfering in business and making life unpredictable for businesses. And yet, Republicans passed this law in Alabama and that's exactly what it does. Alabama state Sen. Scott Beason, who sponsored the bill, says the status quo needed to change because businesses were being forced to hire undocumented workers if a competitor did so in order to keep their own business afloat. "As they undercut the prices for their subcontractors, you begin to see people no longer in the drywall business, [it's] more difficult to be in the painting business, bricklaying or that sort of thing," Beason says, using the example of a construction company. "So over the years you end up with a big problem growing where more and more people hire more and more illegals." Beason is now hearing complaints from local businesses that say it is difficult for them to hire workers and keep their businesses running, but he says that fixing any problem takes a period of adjustment. "It is not going to be smooth and easy for every single person," he says, "especially if you've been out there basing your business, basing your livelihood, on breaking the law and hiring an illegal workforce." Beason says the state did its job to warn businesses that the new law was coming and it is unfortunate that many businesses did not change the way they did business to get over the last few weeks of harvest. He also says, despite what some people believe, he thinks Americans are willing to do these jobs. "There may have to be some differences in pay scale ... but Alabamians and Americans will do those jobs," he says. Some economists theorize that without all those undocumented immigrants, the supply of labor will dry up and businesses will have to pay more to attract new, legal workers. Tomatoes end up costing more, but Alabama's 10 percent employment rate goes down. Hanson says these new laws are so tough, though, it may be difficult to go back — if the law stays in effect. The U.S. Justice Department has asked an appeals court to look at the constitutionality of Alabama's law.